This rare example of a hanging lum dominates the kitchen in Moirlanich Longhouse, a traditional cruck-framed cottage and byre based in the remote Glen Lochay. Travel through the village of Killin in Stirlingshire, passing the Falls of Dochart and the Victorian ‘tin tabernacle’ church, and you will find a minor road on the left which takes you into Glen Lochay. 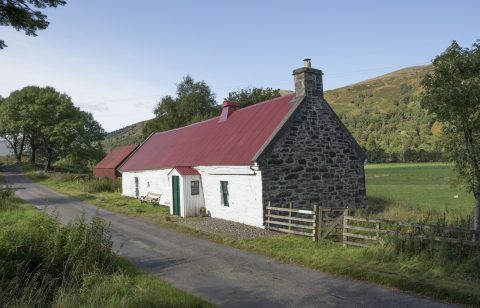 There you will discover Moirlanich Longhouse, a rare survival of its type. The house is thought to date from the late 18th to mid-19th century and, according to the tenant records of the Boreland Estate, was occupied by the Gaelic-speaking Robertson family from 1809 to 1968, when the last family member died. It was purchased by the National Trust for Scotland in 1992. A longhouse, or byre dwelling, was a linear house that provided accommodation for both the family and animals (mainly cattle) under one roof and on the same level. Like the blackhouses that preceded it, the main source of heat was the hearth on the floor in the middle of the main room, where the smoke would rise to the ceiling and escape through a hole in the roof. 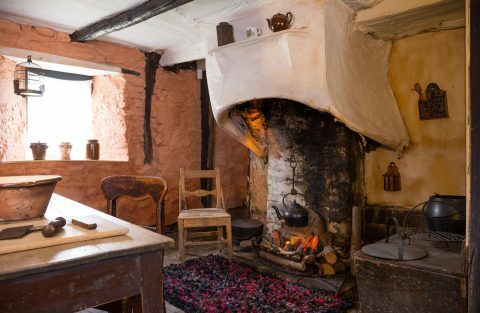 The hearth was the focus of Highland hospitality and was used to warm the home, cook food, burn rubbish and dry clothing, while the ashes provided manure for the fields and gardens. 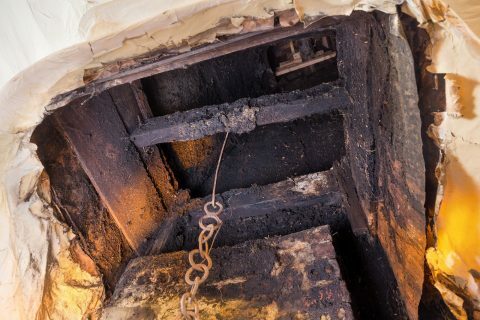 It was kept alight at all times and the main fuel would have been wood, coal, turf or peat, with the latter being the preferred choice as it did not spark as much as the other materials. It was often said that in a house like this, if the fire was permanently extinguished the building would fall apart quickly. This appears to be true as the building required extensive repairs when it was taken over by the Trust. 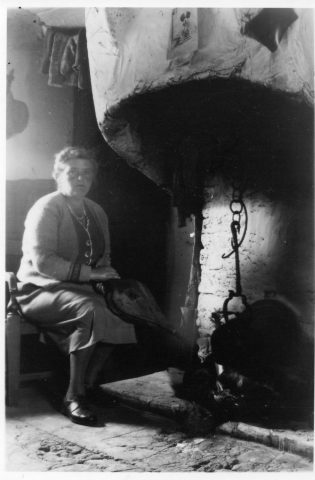 The kitchen in Moirlanich has direct access to the byre and is dominated by a hingin’ lum, Scots for hanging chimney, which would have ‘reeked’ (smoked) all day long. 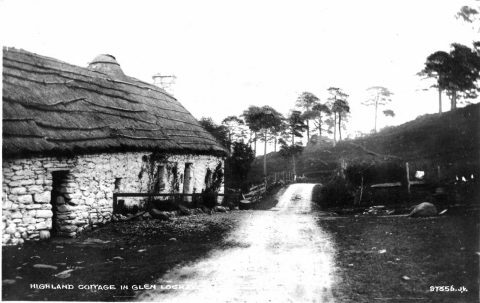 Although hanging chimneys were used in buildings during the medieval period, the hingin’ lum design we see in 18th–20th-century dwellings originated in the Lothian area of Scotland – the earliest name given to this structure was the ‘Lodian Brace’. This type of lum spread across Scotland and had reached Perthshire by 1771, when a ‘Lothian Brase’ was fitted to a new farmhouse kitchen. Made of wood and paper, this rare example at Moirlanich has a more ballooned shape than the traditional rectangular frame and the flue is tapered, which is common in houses with thatched roofs. Some of the original thatch can still be seen inside the dwelling and it was likely kept for insulation purposes when the roof and chimney stack were replaced with corrugated iron in the 1940s. Moirlanich’s kitchen fireplace is fondly remembered by the residents of Killin. There was always a black kettle, pot or frying pan hanging above it – these were moved along the horizontal bar inside the overhanging canopy to warmer or cooler parts of the fire when required. The hearth was continually kept burning and would have provided great warmth to those who used the box beds in the kitchen and the little back room behind the lum. With the faint smoky scent still in the air, it is easy to imagine the various creepies (small wooden stools) in the property scattered around the fire and being used by friends, family and workers in the evenings to discuss their daily work and to swap stories and songs. This article is by Sarah Heaton, Project Reveal West Team Manager. Project Reveal is a multi-site digitization project of unprecedented scale. With your support, we can help the Trust manage its collections more effectively. Most important, we can help the Trust discover, better understand, and share its treasures with the world.